Science-fiction adventure movies don't get much more thrilling then this curious movie from the director of THE SON OF KONG (1933) Ernest B. Schoedsack. Sure there has been more thrilling movies since this 1940's film but at the time this movie came out it didn't have many competitors to its special effects splendor. Set in the Peruvian jungle, four explorers go in search of Dr. Thorkel (a.k.a. Dr. Cyclops) who has secluded himself away to work on his experiments. Upon finding the mad scientist and insisting that he return home with them, he pushes them into his make shift experimentation lab where he shrinks the unwilling participants. Upon awakening and now standing each at a mere 14 inches tall they must now fight not only against Dr. Thorkel but also against a hungry cat and other such dangers. Written by Tom Kilpatrick who was a contributing writer to the 1934 film THE BLACK CAT, this 1940's movie has many moments of tension and shock. Not only are there moments where the main characters have their miniature lives at risk, but the shock also comes in how good the special effects are. Sure compared to todays standard of CGI fire and smoke the special effects here may look ropey, but for those who enjoy these movies and how pioneering they are the effects are in a whole realm of there own. Beautifully shot in Technicolour it is not surprising to find that this movie was nominated for the 'Best Visual Effects' Oscar in 1940. The effects are undoubtedly amazing but the acting oh my...besides Albert Dekker as Dr. Thorkel/Dr. Cyclops who plays his role with an intensity unmatched, you will find some of the other actors more wooden then the sets. A curious movie which at times can seem special effects heavy but considering some of the dialogue you need the distraction. 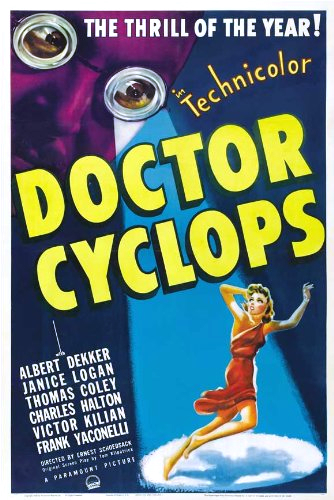 DR. CYCLOPS is a movie that is hardly mentioned alongside other such movies of its time, but I for one recommend checking this movie out and watching alongside some other 1940's sci-fi/horror. Do they still make B movies? I used to see them 45 years ago as an add on to the main film, but cannot remember any. Anyway one persons B movie is not anothers. Does Army of Darkness count as a B movie? If so, that's mine by a mile! I think my favourite Dracula would have to be the late Sir Christopher Lee.